Mica sheets classification - Borosilicate and quartz glass, mica, sealing, level gauges, armature - Continental Trade. Mica plates, also called block mica, are natural mica sheets of irregular shape and thickness from 0.18 to 16.00 mm. Mica occurs very commonly in sheets of area size from 6 to 90 cm2. Larger sizes are very rare (and thus - very expensive). Mica is a natural product - fossil mineral. Thus, depending on the deposit, the environment in which it occurs, geological and natural conditions, etc. can occur in various types and have a different quality. 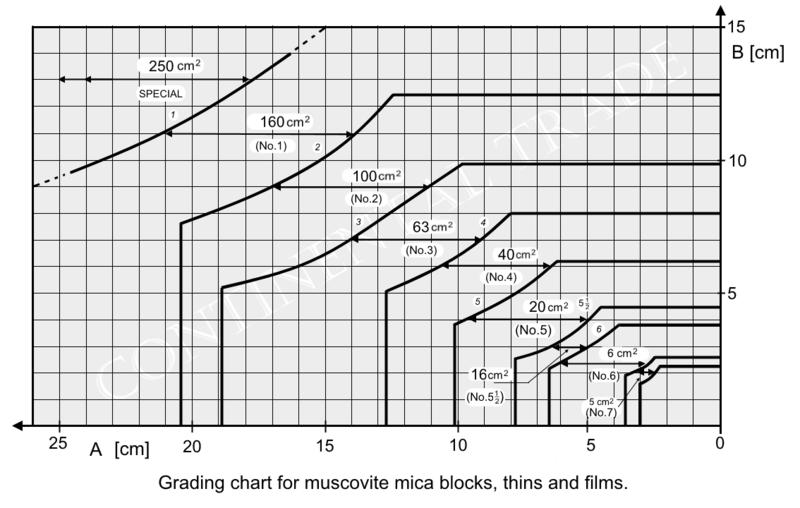 In order to improve business communication, mica blocks has been classified according to various criteria such as: size of the plates, thickness, purity, hardness, structural defects (scratches, cracks, inclusions) or transparency mica. For commercial mica transactions is commonly used standardization suggested by ASTM (American Society for Testing and Material) and published in the form of standard D 351 Classification for Natural Muscovite Block Mica and Thins Based on Visual Quality. It allows perform the classification solely on the by visual inspection mica sheet, without the need for complex physico-chemical analyzes. Depending on the size, can distinguish different categories of natural mica plates (see below). As a criterion was adopted area of the largest square that can be cut out of the plate. To assign the plate to the category it must allow cutout of a square with a minimum area assigned to this category. Additional, the minimum length of one side is specified. To assign the plate to the category must be satisfied simultaneously both criteria (area and length of the side). To rapidly assign the plate to a specific category, special template is used. Template is shown in the figure below. Full scale drawing of the template as a PDF file (for download) is available here. Depending on quality, in D-351 ASTM standard, there are 12 categories of mica sheets (note: some companies use their own classifications, which may contain a different number of categories). Bellow are described the various categories (form V-1 to V-10A) in accordance with the specifications of ASTM, also used in our company. A lower number of category means, generally speaking, the better the quality of the mica plate. V-1 Clear Hard, of uniform color, nearly flat, free of all stains, foreign inclusion, cracks, and other similar defects. V-2 Clear and Slightly Stained Hard, of uniform color, nearly flat and may contain slight crystallographic discoloration, and very slight air inclusions and not more than one fourth of the usable area. V-3 Fair Stained Hard, of uniform color, may contain slight waves, slight crystallographic discoloration, and slight air inclusions and not more than one-half of the usable area. V-4 Good Stained Hard, of uniform color, may contain medium waves slight crystallographic discoloration, and medium air inclusion in not more than two-third of the usable area. V-5 Stained A Quality Hard, may contain medium air inclusions, uniformly distributed in the usable area; slight green vegetable stains, medium waviness, and heavy waves if specified. Hard, may contain heavy air inclusions and heavy waves, medium green vegetable stains, slight black and red dots (mineral) and clay stains. V-7 Heavy Stained Hard, and may contain heavy air inclusions and waves, slight light black and red dots (mineral), medium cloudy stains, clay stains and green stains (vegetable). Soft, buckles, ridges, and sand blast acceptable if specified. V-7A Densely Stained Hard and soft. May contain heavy waves and air inclusions, cloudy stains. High black and red dots (mineral). Medium black and red stained (mineral), buckles, and ridges. Also, green stain (vegetable type), clay stains, herringbones, and sand blast. V-8 Black Dotted Hard, may contain medium waves, heavy air inclusions, cloudy stains, light black and red dots (mineral), and green stains (vegetable). V-9 Black Spotted Hard, may contain medium waves, heavy air inclusions, cloudy stains, light black and red dots (mineral), and green stains (vegetable type), slight black stains (mineral), and sand blast. V-10 Black Stained Hard, may contain medium waves, heavy air inclusions, cloudy stains, light black and red dots (mineral), green stains (vegetable type), and sand blast, medium black stains (mineral), slight red stains (mineral), and clay stains. V-10A Densely Black and Red Stained Hard, may contain heavy waves, air inclusion, cloudy stains, light black and red dots (mineral), red stains (mineral), black and red stains (mineral), green stains (vegetable type), and sand blast, very dense black and red stains (mineral), and slight clay stains. Soft if specified. Detailed specification of each category is contained in the following table, which as a PDF file is available here for download.